The big day is almost here! Are you ready to join us in Salem on April 10 from 10:00 am to 2:00 pm for the “Advocacy Day” focusing on EI/ECSE services? The Oregon Alliance for Early Intervention is partnering with the Intellectual and Developmental Disability Coalition’s GO! Project to offer information, training, and support to EI/ECSE advocates who are able to come to the Capitol to share their stories with legislators. It’s just a few short weeks away...What should you do now to prepare? Do some research and get to know your State Senator and State Representative by looking at their bios and other information on their legislative websites and social media. You can also learn about their activities and interests through Internet searches. Practice telling your story about the impact EI/ECSE services have had on your family. If you are new to advocacy or haven’t told your story before, see the article on “Telling Your Story to Your Legislator” in this newsletter or watch FACT Oregon’s online module, “Telling Your Story: Introduction to Advocacy” to help you prepare. Check out the Oregon Alliance for Early Intervention's website and the 2017 Oregon AEI Fact Sheet for information and advocacy resources. The truth is, your state legislators not only NEED to meet with you, they WANT to meet with you. They were elected to represent you and your interests at the legislature, so they need to hear what’s important to you in order to do their job. They also want to meet with you because they’re people just like we are, and they are interested in making a personal connection with everyone they represent! Legislators love meeting with their constituents (YOU! ), and most will prioritize that above everything else in the work they do each day. Your meeting will be an opportunity to have a direct conversation with your legislator about the things that are important to you. Remember, everyone has a story to tell, and no one can tell yours better than you! Whether you’re a parent raising a child experiencing disability, or a provider working with children in EI/ECSE programs, your experience gives you a unique perspective. Your story is a powerful way to connect with your legislator. Finish up by asking your legislator to provide sufficient funds for EI/ECSE programs so that all eligible children can receive the recommended level of service now in order to reduce the need for interventions later in life. Give your legislator a copy of the EI/ECSE Fact Sheet so they have additional data on the impact of these programs and on the critical need for additional funding. It’s always a good idea to reach out after your visit by email or handwritten card to thank your legislator for making time to see you. Tip: this also gives you one more opportunity to reinforce key points from your meeting! Developing a relationship with your elected officials, and being an engaged constituent is extremely important! Whether you email, call, or show up in person, we encourage you to take time to share your story with your legislators. They are waiting to hear from you, so don’t delay! To help you in your advocacy, Oregon AEI has developed an EI/ECSE fact sheet with current data and talking points that explains all the areas we are asking our state legislators to support. EI/ECSE needs an additional $60 million to provide all eligible children the recommended level of service now in order to reduce the need for interventions later in life. Right now, only 28.3% of children in EI receive the recommended level of service, and a mere 2.1% of the high needs children in ECSE receive the recommended level of service! Join us by raising your voice in support of EI/ECSE services! Thanks to the many advocates who took time to share their stories in person or in writing at the recent statewide “road show” budget hearings or at the Public Testimony Day hearing on SB 5516, which is the bill that contains the budget for EI/ECSE services. Members of the Ways and Means Education SubCommittee heard many compelling stories of the life-changing impact of these services. They listened to families and providers share about the critical need for increased funding so that children can receive the recommended levels of service while they are young in order to minimize the need for interventions later in life. After the Ways and Means Education SubCommittee is finished doing its deeper dive and developing the detail on the education budget, it will release its funding recommendations for agency programs and services. Oregon AEI would like to share a story from an Oregon mom who recently traveled to Salem to meet with her legislator for the first time. Heidi is a self-described “non-political person,” but with recent proposed budget cuts hitting the news, she felt motivated and empowered to share her family’s experience with early intervention and special education with her state senator. "...Early Childhood Special Education (ECSE) services in our state are not meeting recommended service levels. We moved here from Arizona in January of 2015. My daughter has been receiving either Early Intervention (EI) or ECSE services in Arizona since she was three months old. When she turned three, she began going to ECSE preschool for 12 hours a week. 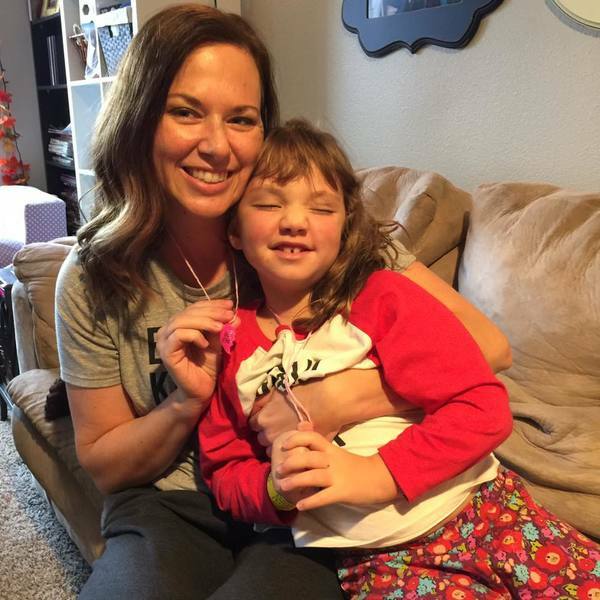 During those 12 hours, she would meet with physical, occupational, and speech therapists on a 1:1 basis for an hour each week." Click to read "Advocating for Izzy"
Last month, members of the House Committee on Early Childhood and Family Supports held an informational hearing on “Early Intervention in Special Education.” This was an opportunity to shine a light on the good work of Early Intervention/Early Childhood Special Education (EI/ECSE) programs in our state, as well as highlight some of the challenges they face. Nancy Johnson-Dorn, Director of EI/ECSE in Oregon Department of Education's (ODE) Office of Student Services, assembled a group of providers and parents to help give a comprehensive presentation to legislators. In addition to providing an overview of EI/ECSE services, Nancy shared some of the unique challenges these programs face, such as providing individualized services to all eligible children based on their needs, offering services as caseloads continue to grow, and serving newly eligible children within existing budgets. Underlying these challenges was how tied these services are to increasing a child’s potential for lifelong success and preventing the need for more costly special education when they get to school. The presentation also highlighted the disparity in the level of service being provided to young children versus the recommendations for what level of service they should be receiving. For example, children between the ages of 3 and 5 who are identified as having the highest level of need are recommended to receive 15 hours a week in a preschool class, a weekly preschool consultation, and a monthly family education service. Data provided by ODE showed that only about two percent of children with the highest level of need are receiving these recommended levels of service. Judy Newman, Co-Director, Early Childhood Cares in Lane County, and Dr. Monique J. Carroll, a pediatrician for Community Health Centers in Lane County, walked the committee through the referral and eligibility determination process, emphasizing that services are meant to be provided as soon as a child is identified in order to minimize the impact of their disability. If you would like to learn more about EI/ECSE services, you can watch the informational hearing, or check out the meeting materials posted on the Oregon AEI website.